If you are involved or have an interest in the arts, culture or heritage it would be hard to escape recent debate about the negative impact funding cuts have had. Be they under the guise of imposed efficiency dividends or unsuccessful applications to the Australia Council, the hurt is real and as a broad sector we are challenged to respond. Our national cultural institutions, The National Gallery, National Library, National Museum and others, are suffering – forced to cut staff and programs. And Australia wide, many small to medium arts companies, often described as the engine rooms of innovation and expression, are re-evaluating their viability and capacity to survive. All this is happening against a backdrop where, through historical, policy and cultural anomalies, major performing arts companies are quarantined from cuts. 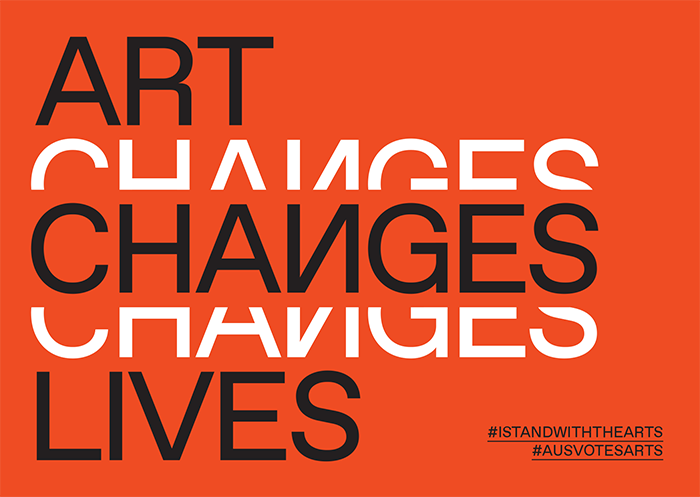 Under the banner, Fund Culture, Fund Art, Change Lives, a National Day of Action on June 17 has been organised to coincide with the current federal election campaign. How can I support the arts you might ask? On July 2nd vote for what you consider the best arts policy. The arts employ more people than agriculture, construction or mining. It is estimated that creative industries generate $50 billion for the Australian economy. Independent artists and organisations are the backbone of arts activity in Australia, generating new ideas and new talent. Artists are the innovators of our nation. And if you need more convincing to be involved, and you live in regional Australia, need I remind you of the impact recent funding decisions have had on the National Exhibition Touring Support network (or NETS Australia). The Australia Council for the Arts’ recent announcement revealed that four of the organisations that comprise the NETS Australia network, servicing Western Australia, New South Wales, Queensland and Victoria, would no longer receive operational funding. This has jeopardised scores of projects set to tour to regional Australian galleries in the coming months and years. Affected organisations include ART ON THE MOVE (WA), Museums & Galleries of NSW, Museums & Galleries Queensland and NETS Victoria. In conclusion, I hope you all participate in and enjoy conversations to be had on June 17th.